On Monday Marie and I took a bus to Siem Reap, the city that serves as a base for exploring the ancient temples of Angkor. A tuk-tuk driver we met in Phnom Penh arranged to have a friend of his – someone who apparently went by the name “Mr. Hart” – pick us up at the bus station and take us to our hotel. If we liked Mr. Hart we could hire him to be our driver for the next three days. Marie was sold on Mr. Hart as soon as she heard his name. I suspected I knew why: “Because that’s what the chauffer on Hart to Hart called Robert Wagner?” I asked. Yep, sure enough. When we pulled into the bus station Mr. Hart was there holding a sign that read “Mister Rob.” He dropped us off at our hotel and agreed to meet us again the next morning. 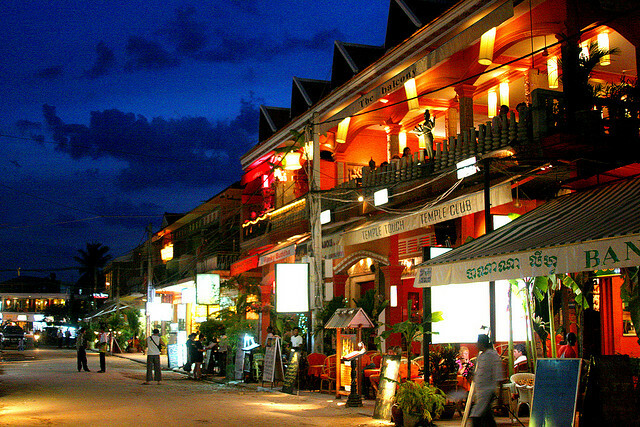 By the time we checked into our hotel it was late afternoon, so we just caught a ride to the downtown area of Siem Reap and had dinner. At sunset I had a chance to recreate a photo I took four years ago. I’d already warned Marie that I wanted to take sunrise photos at least twice, and Mr. Hart was set to meet us at 4:45 the next morning so we could be at Angkor Wat by 5:30. Marie calculated that in order to shower and dry her hair she needed to wake up at 3:30am. My helpful suggestion that she should “Just wear a hat” was not well received. 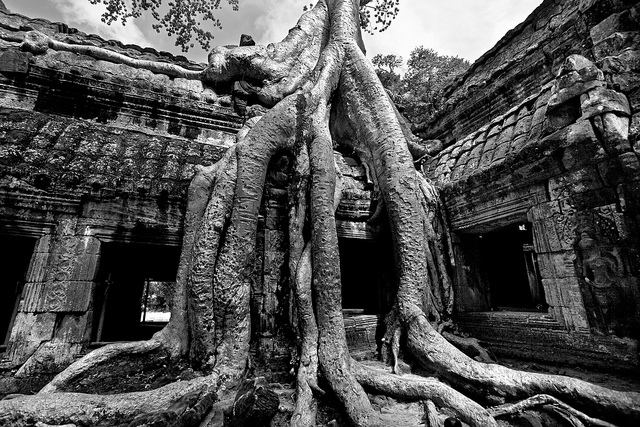 Angkor Wat is the heart of Cambodia. 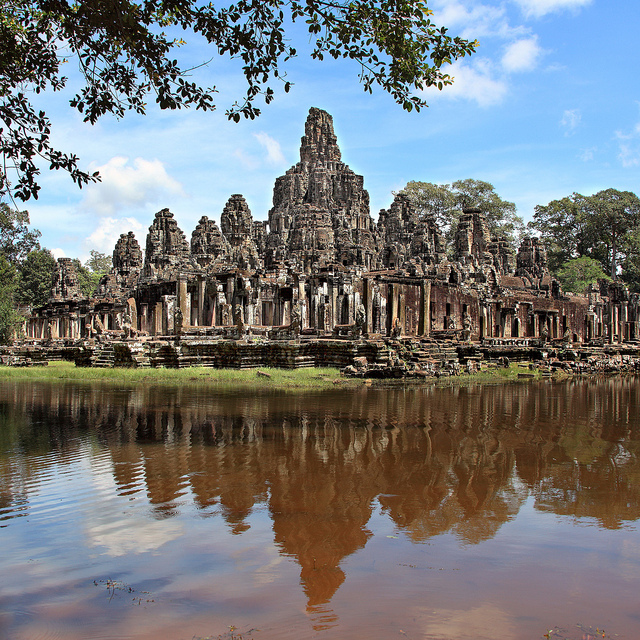 Its image is featured on the country’s flag and currency, it’s one of the most popular tourist attractions in Southeast Asia, and the national beer is called “Angkor.” Why all the fuss? 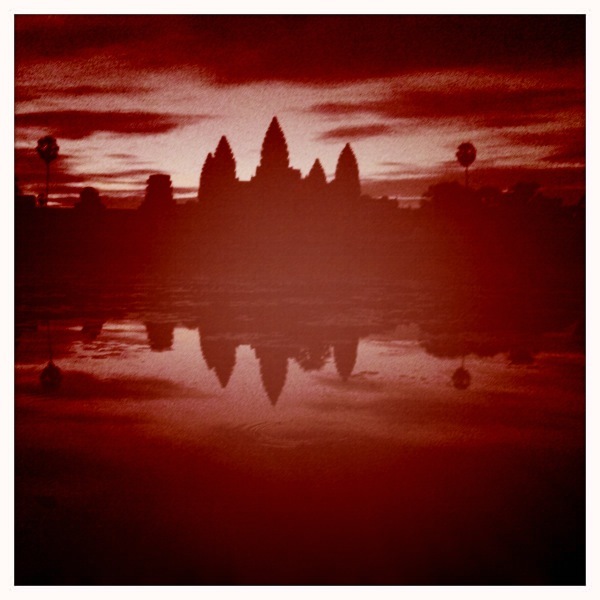 And that’s just Angkor Wat. 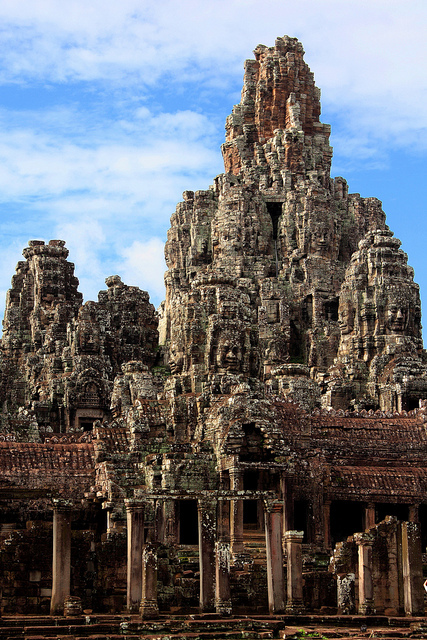 The broader Angkor complex includes over a thousand other ancient temples constructed by a series of Khmer god-kings between 800 and 1300 AD. 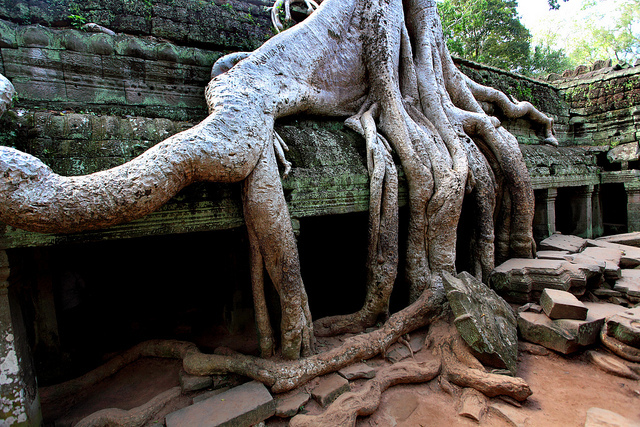 Some of the minor temples in Angkor would, by themselves, be the primary tourist attraction in most other countries. Normally I struggle to get out of bed to take pre-dawn photos. 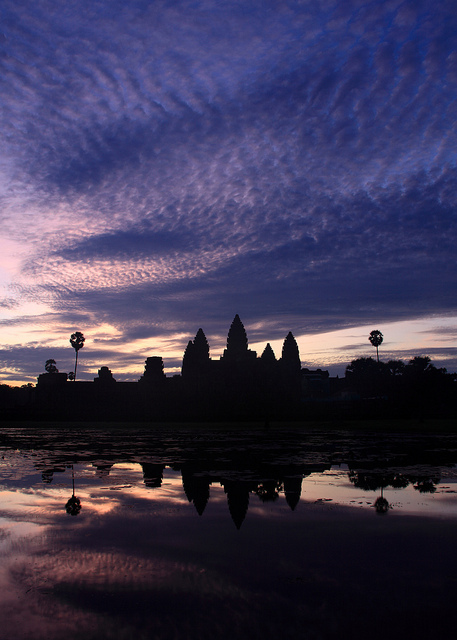 But with Angkor waiting, waking up was no problem. Mr. Hart met me and Marie, as planned, at 4:45am. 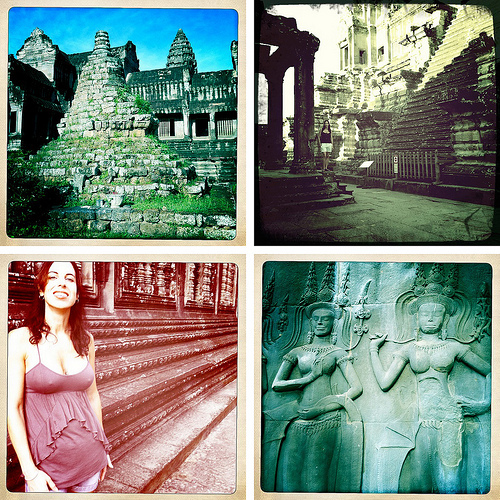 We made a quick stop to buy our three-day passes and then went right to Angkor Wat. In the pre-dawn darkness we had to use a flashlight to find our way to the best spot for photos, although we had plenty of help from Cambodian entrepreneurs who, even at that hour, wanted to sell us breakfast, coffee, or the use of a chair while we waited for sunrise. At first there weren’t many other tourists around, but by the time the sun rose at least 100 of us were trying to get the classic Angkor Wat shot. The clouds were great that morning, but I’d been hoping we’d get some red color in the sky. Instead I had to provide my own red by taking a few shots with Hipstamatic, an iPhone app that Graham, who I met on the Gibbon Experience, recommended. It uses the iPhone’s camera to simulate the retro look of different vintage lenses and films. 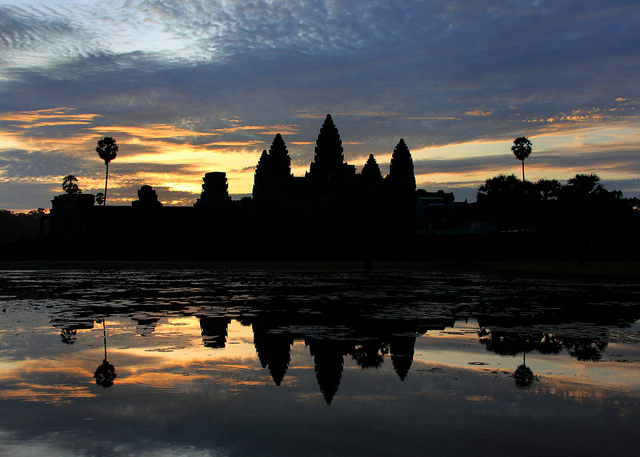 Once the sun rose we started walking around the rest of Angkor Wat. 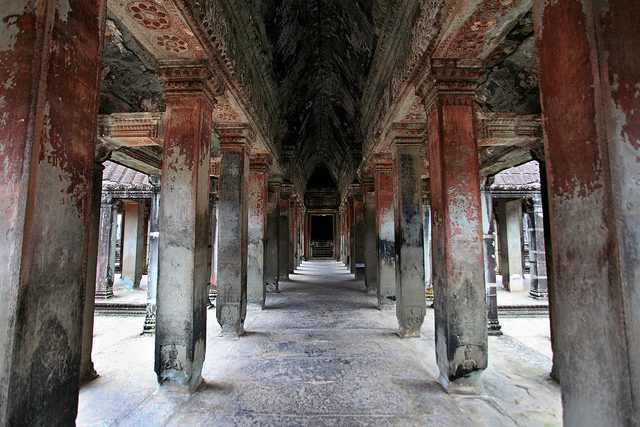 During my previous visit I learned that photos showing only the buildings of Angkor Wat in normal daylight tend to be boring. The best way to add some interest is to find and include one of the two Ms: monks or monkeys. 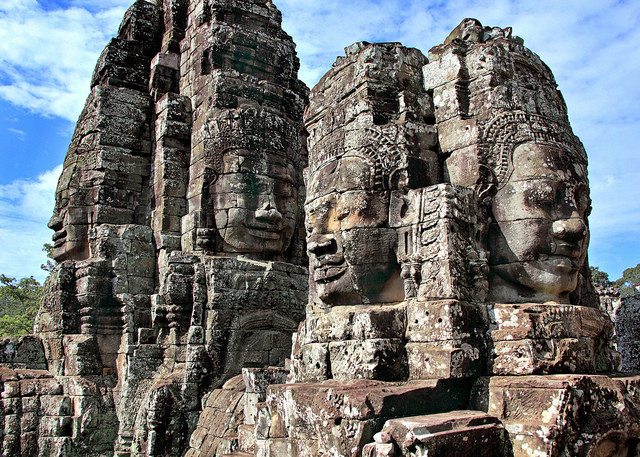 The bright orange robes of a monk contrast really nicely with Angkor’s gray stone. And adding monkeys just makes anything better. Unfortunately, though, no luck that morning – we hunted for over an hour and couldn’t find either M. Then I realized I had a third M right there in front of me, and Marie was a great sport about posing for photos. On the way from Angkor to Bayon we passed a group of elephants waiting to give rides to tourists. We planned to ride an elephant up to Phnom Bakheng later in the day, so we just stopped to say hello and give them a few bananas. Marie found that handing out food made her very popular with her new friends. 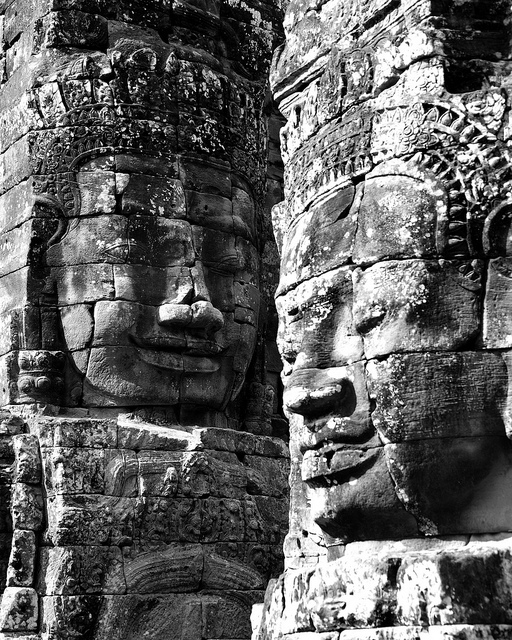 Bayon is my second-favorite Angkor temple. From a distance it looks like a crazy, jumbled pile of rocks. Up close it still looks like a crazy pile of rocks, but you start to feel a sense of balance and harmony in the design, and you realize you’re being watched by hundreds of huge stone faces carved into the temple’s towers. 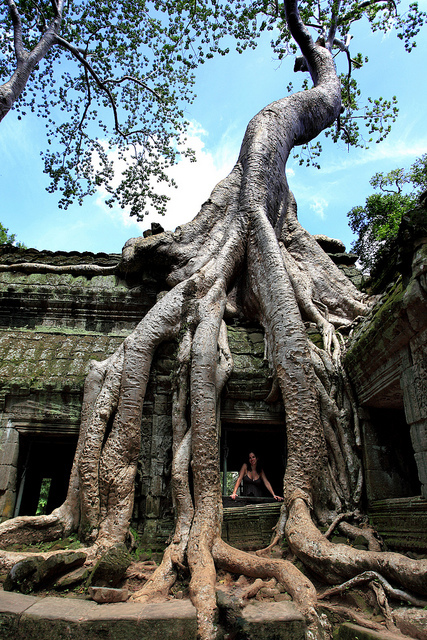 Next up was Ta Prohm, my third-favorite temple, which boasts a Hollywood claim to fame: it appeared in the Angelina Jolie movie Tomb Raider. 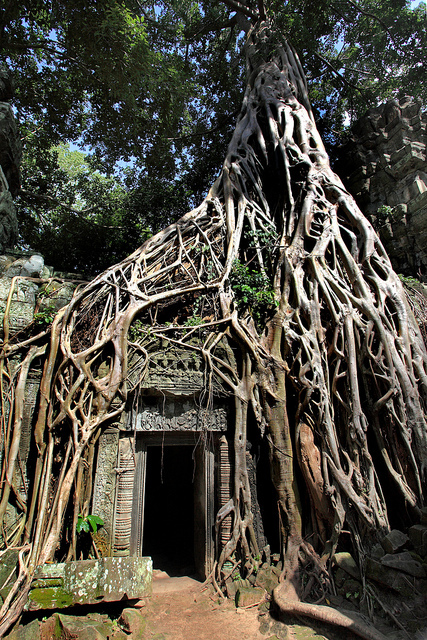 Parts of Ta Prohm were reclaimed by the jungle a very long time ago and roots of large trees now cover several of the buildings. 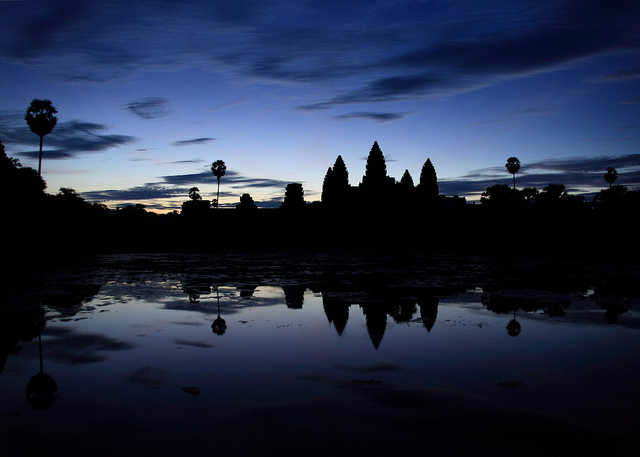 No tour of Angkor’s highlights would be complete without a trip up the hill to Phnom Bakheng to watch the sunset. We rode an elephant up to the temple, saving us energy and marking the first time Marie had ever traveled by pachyderm. “Walking is for suckers,” we agreed. “Lots of red in the sky?” I asked. “Oh yes, very red,” he assured us. Thanks to a wall of clouds the sunset was a dud. A small opening lit up with color but the rest of the sky stayed gray until the sun was all the way down. On the way back to the hotel, however, the photography gods compensated for the disappointing sunset. 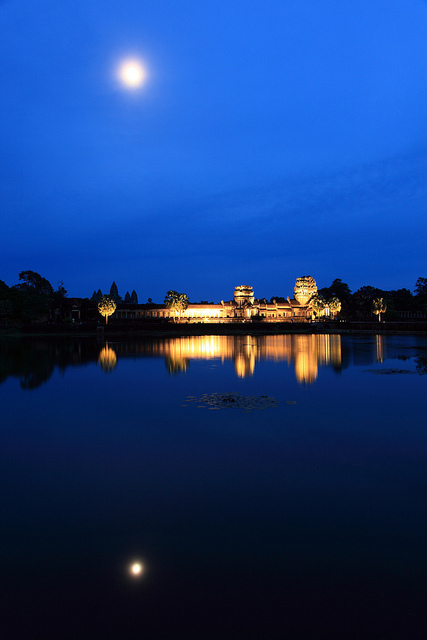 The front gate of Angkor Wat was lit up (only because of restoration work, I think) – a beautiful sight made even better by the moon rising overhead and reflecting in the moat. Marie and I felt great about our first day at Angkor – we put in a solid 12 hours at the temples and saw one amazing place after another. 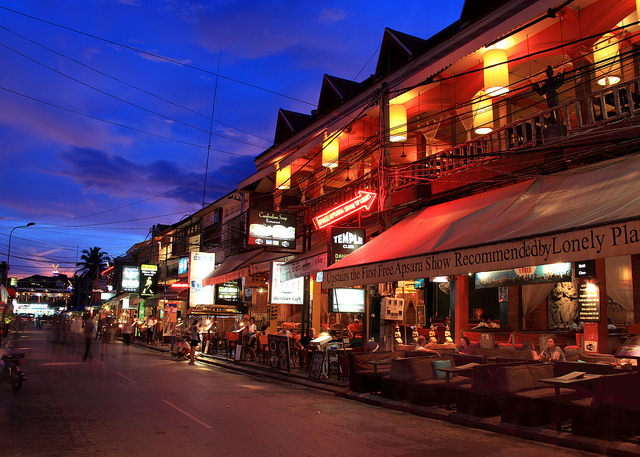 We looked forward to changing out of our sweat-soaked clothes and having a beer.